Princess Harriet Hamsterbone doesn't go looking for trouble. She prefers to think of it as looking for adventure. But when she climbs to the top of an enormous beanstalk and sneaks into the castle at the top, Harriet finds plenty of both. The castle is home to one very poetically challenged giant rabbit with two unusual prisoners—a girl who is half harp, half hamster, and an extremely large goose. This calls for a heroic rescue, and Harriet is just the hamster for the job. 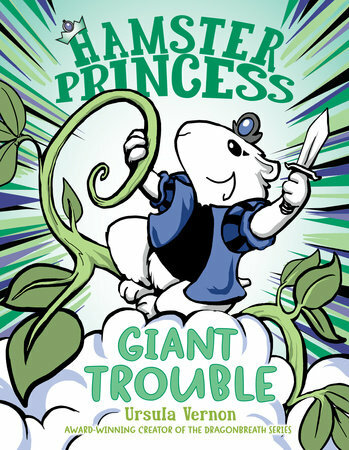 The fourth installment of the critically acclaimed Hamster Princess series turns the story of Jack and the Beanstalk upside down, with plenty of laughs along the way.